The sole function of the shoulder is to properly position the hand for grasping, reaching, lifting, and catching. One in three people over the age of 30 have abnormal MRI findings related to their shoulder. In many instances, these individuals had no pain! ​Shoulder impingement & rotator cuff tears are common diagnosis'. These can be effectively treated by strengthening the shoulder blade muscles and rotator cuff muscles, and gradually improving shoulder range of motion. Shoulder pain can feel debilitating. It often hurts when you sit, walk, and even sleep. The natural feeling is that you need to get an MRI. However, be cautious! 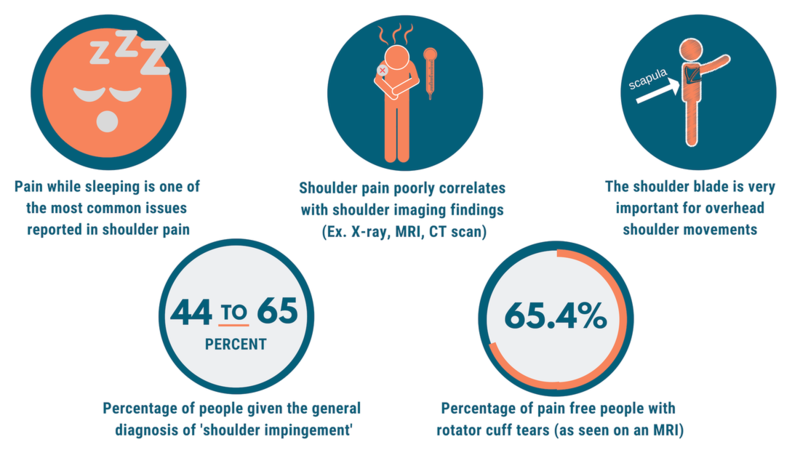 Nearly 70% of people without any shoulder pain were shown to have a torn rotator cuff on an MRI. This means that the imaging is not telling the full story. Recent research shows that gradually restoring range of motion and strengthening the shoulder blade muscles are keys to returning you back to the activities you enjoy most! You just learned about shoulder pain in general, now follow our shoulder pain exercises, soft tissue videos, and additional shoulder pain advice below.